← Gia Allemand DEAD at 29! Lauren Silverman just got the green light to move forward with her relationship with Simon Cowell, because she just settled her divorce with estranged husband and real estate mogul Andrew Silverman. Sources say the Silverman’s worked out some sort of custody agreement for their 7 year old son, and Lauren WILL be staying in NYC (despite rumors that she was moving to California to live with Simon Cowell in Beverly Hills). We are told that Andrew settled the divorce and Lauren will get just north of $2 Million…..that is definitley enough to start her NYC boutique and expenses…..although Im sure Simon Cowell will have no problem pony-ing up the money for his baby momma! 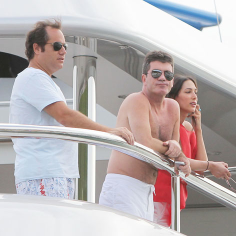 This is the first child for Simon Cowell and the second for Lauren Silverman….Updates on the divorce details to follow! Posted on August 14, 2013, in Uncategorized and tagged Anderw Silverman, Celeb news, divorce, Lauren Silverman, love, nyc, Simon Cowell. Bookmark the permalink. Leave a comment.